Congregation Ahavas Shalom,the oldest operating synagogue in Newark, is a reminiscent of the city's vibrant Jewish community in the early twentieth century. Located to the north of Newark's Central Business District, the synagogue was designed in the Classical Revival style and originally constructed in 1921-1923. The synagogue contains the oldest remaining Ark in the State of New Jersey, an elaborate mahogany screen originally built for a Anshe Chesed synagogue in New York City in 1872. 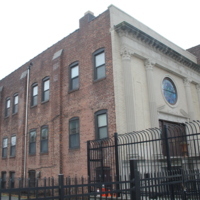 When they moved to another location in Manhattan, the ark was presented to Ahavas Shalom. The ark was transported in sections and was trimmed to fit they synaoguge by congregation founder and cabinetmaker Leopold Jacobson. In the Post-War era, as a result of rapid suburbanization and simmering racial conflicts, which culminated in 1967 riots, the population of Newark dwindled, so did the number of Jews. Ahavas Sholom started to become an untenable operation. Recently, however, thanks to the establishment of New Jersey's Jewish Museum on the premises of the synagogue, Ahavas Sholom is almost thriving. Ard, Patricia M. and Rockland, Michael Aaron. The Jews of New Jersey: A Pictorial History, New Brunswick, New Jersey: Rutgers University Press, 2002. 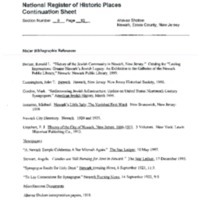 Becker, Ronald L., "History of the Jewish Community in Newark, New Jersey." Catalog for "Lasting Impressions: Greater Newark's Jewish Legacy: An Exhibition in the Galleries of the Newark Public Library," Newark: Newark Public Library, 1995. Cunningham, John T. Newark, Newark, New Jersey: New Jersey Historical Society, 1966. Gordon, Mark W., and Anthony Schuman, editors. Newark Landmark Treasures: A Guide to the Landmark Buildings, Parks, Public Art & Historic Districts in New Jersey’s Metropolis. Newark Preservation and Landmarks Committee, 2016, p. 61. Helmreich, William B. The Enduring Community: The Jews of Newark and MetroWest, New Brunswick, New Jersey: Transaction Publishers, 1991. National Register of Historic Places, Ahavas Shalom, Newark, Essex County, New Jersey, National Register #00001530.